David Oil Paintings - Art Reproductions Hand Painted. When Jacques-Louis David came back from France from Italy in 1780, he returned with strong ideals based on the supposed virtues of ancient Rome. He was committed to Neo-classicism, which demanded that artists should take their subjects and style from antique models, as Poussin had 150 years previously. The French responded by electing David to both the Academy and the Salon. His highly finished line, colour and composition were greatly admired. More than that, his style was perceived as revolutionary, matching the country's mood for an end to aristocratic corruption and a return to the stern, patriotic morals of republican Rome. Upon joining the revolutionary Convention, David voted for Louis XVI's execution. But on the death of Robespierre and the end of the Reign of Terror, he was gaoled and might have been executed too, had his royalist wife not intervened with the new "Emperor", Napoloen Bonaparte. David became a devoted follower of Napoleon. He found himself at the height of his influence and gained a knighthood in the new Legion of Honour. 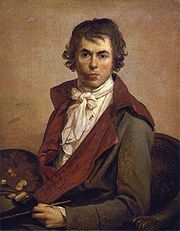 Exiled to Brussels after Napoleon's fall from power in 1816, David - an outstanding teacher - continued to train young painters, including Ingres. He was the virtual art dictator of France for a generation; his influence spread to fashion, furniture design and interiors, and found echoes in the development of moral philosophy. He died in Brussels, 1825.